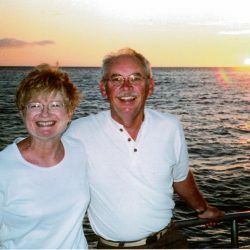 Editor’s note from Carol Roberts, ACRES Quarterly editor and board vice president: Tom was my friend, neighbor, mentor in the natural world. I cared more about nature after seeing it more closely through his eyes. 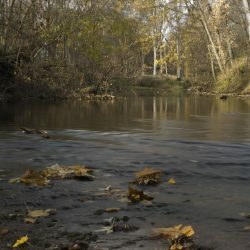 He fought passionately and persevered to protect the Indiana Dunes, Wyoming’s Red Desert…his beloved Cedar Creek. While Tom’s vision was far-reaching, he always paid attention to what was actually in front of him, grounding him and us in the reality of here and now. Tom Dustin’s observations compress 40 years of wildlife viewing from the home he and Jane built high over Cedar Creek. His comments (first published in the summer 1998 Quarterly) originally accompanied scientific documentation on land the Dustins later donated to ACRES; their home became ACRES’ office. I know Tom and Jane would rejoice in today’s returning wildlife, a return hastened, in part, by ACRES’ work in the Cedar Creek watershed. Wildlife habitat and biodiversity will continue to increase with future ACRES land acquisitions. 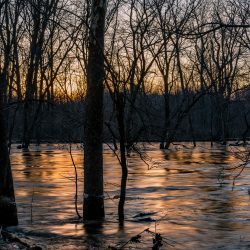 To recall the variety of living things observed over more than 40 years in the Dustin woods and wetlands along Cedar Creek would take yet another lifetime; and we won’t be afforded another span of that length. 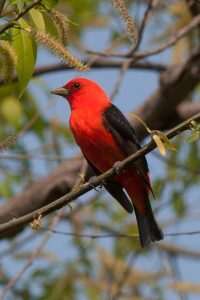 “I have looked DOWN on scarlet tanagers from the heights overlooking Cedar Creek, as they flitted about in the bottomland hardwood crowns.” Photo by Dave Fox. The bird species would make a list a yard long. 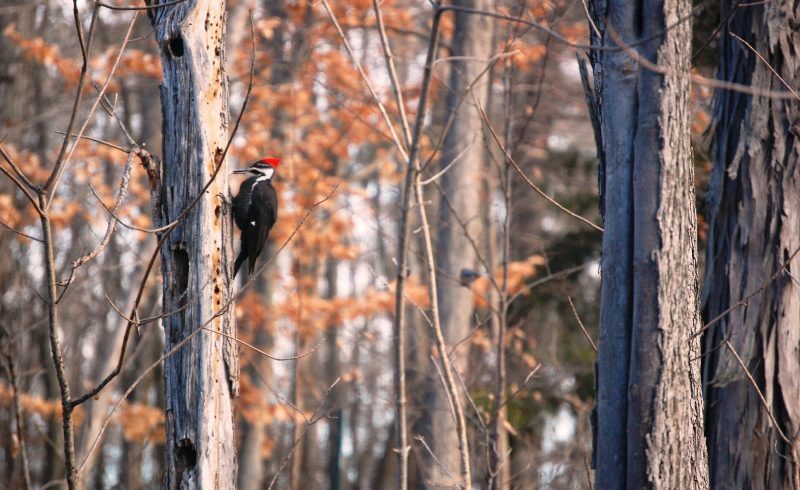 It includes all the common woodpeckers, as well as the pileated [pictured above]. We used to have a few redheaded woodpeckers around too, but I have not seen any of them around for at least 15 years. Some say it’s because their favorite nesting places were in excavated holes in locust [tree] fence posts and these days the posts are all steel. Some of our favorite birds were dozens of bobolinks and several coveys of quail which nested and gathered in our two northeastern fields. But the bobolinks no longer come visiting and I don’t know why. We do all but post the fields with “for rent” signs. Some say it’s because of the destruction of habitat in Central and South America. The quails are another matter. They disappeared too, after the blizzard of the 1978 winter. They have to have a “critical mass” of population, I’m told, to keep each other warm during sub-zero spells. So we keep waiting for their return. It seems unreasonable they’d stay away this long. I have looked DOWN on scarlet tanagers from the heights overlooking Cedar Creek, as they flitted about in the bottomland hardwood crowns. And we have a fair number of indigo buntings that are regularly seen — but though we have bluebird houses mounted here and there, we rarely see the birds themselves. A night rarely passes over the decades when we don’t hear the wonderful voices of the barred owls, who still inhabit this forested landscape in good numbers — and the great horned owls too; but the barred are our personal favorites. 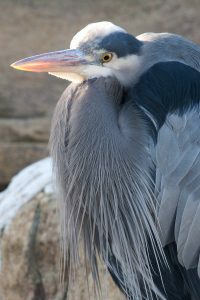 Great Blue Herons are among the Cedar Creek Corridor’s residents. Photo by Dave Fox. The great blue herons come occasionally too, though they nest a mile or so north along Cedar Creek in tall sycamores. By the direction they are flying, we can usually tell if they are going home for the day, or going “out on the town” for a meal. I do miss the blue racer snakes that we used to have in considerable numbers. They were nesting reptiles. You’d see a four-footer along the woodland trail, and both it and you would stop dead in the tracks. Then suddenly, the blue racer — kind of a bitey snake in the first place — would rattle the end of his tail in the dry leaves, scaring the dickens out of you; then, in a flash, he’d dart away leaving you petrified. The wildflowers here are stupendous. My own favorite is a small clump of yellow lady’s slipper orchids — four stems in a square about four inches on a side. They have produced two, or three, blossoms each spring for the past 20 years!!! That’s right, the very same plants, for 20 years. This year, for the first time, there is a fifth plant about six feet away, and it produced a single blossom. It was not there last year, or any other time. They are part way down the slope of a promontory on a fairly well-drained site. Among other birds that will be seen on the premises are the veery, wood thrush (who serenades me regularly), robins of course, and though not present this year or last (1997), the state-listed Yellow-crowned night heron nested just adjacent to our property line on the edge of a marsh/pond where a good growth of wild iris are also found [now ACRES’ Robert C. and Rosella C. Johnson Nature Preserve]. One of the things that always fascinated us was the unexpected presence of muddy chimneys occasionally found on the uplands 70 feet or more above the stream below. We learned that this phenomenon is part of the life cycle of the crawfish. Their main habitat is Cedar Creek, but during part of their life, they crawl all the way up through the woods before digging their muddy chimney. One of the items of grace as the summertime comes along are the clouds of lightning bugs. Part of their life cycle is laying eggs along the edge of Cedar Creek. When the larvae emerge, they inhabit the dark banks. The larvae are luminescent and, in their tens of thousands, they make the bank look like the New York City skyline from the New Jersey Palisades across the Hudson River. Here’s looking at you. 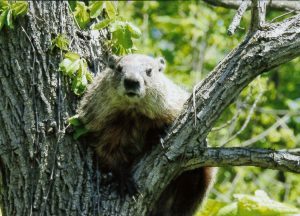 Did you know that woodchucks climb trees? Photo by Richard Latta. We never knew that woodchucks could climb trees, until we saw one do so, and as nimbly as a cat. We occasionally see a fox, or at least his bushy tail disappearing. Deer? Yes, we have herds. Jane has seen a coyote; I have not, but they are known to live around here. Beavers have been known to inhabit Cedar Creek forest bottoms, though their presence has not recently been confirmed. Their past work, at least, is highly visible on adjoining Nature Preserve lands.